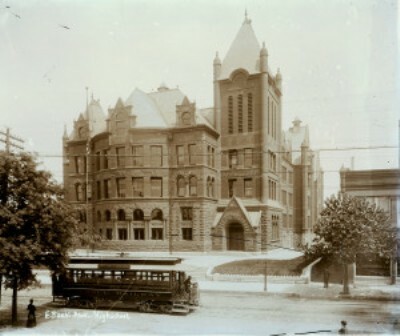 This photo of Central High School from the Missouri History Museum was taken in 1906 and shows a streetcar moving along Grand Avenue at Finney Avenue. Central High was founded at a different location in 1853 and is the oldest public high school west of the Mississippi River. The building you see opened in 1893 at Grand and Finney. It might still stand today if not for a deadly tornado that hit it on September 27, 1927. The twister claimed the lives of 76 people in St. Louis. Five Central High students were killed when the school’s tower collapsed during the tornado. The school was then relocated to nearby Yeatman High School after the tornado. Having moved several times over the years, it is now called Central Visual and Performing Arts High School and is located at 3125 S. Kingshighway. Former UMSL Chancellor Blanche Touhill once taught at Central and former St. Louis Mayor Freeman Bosley, Jr. is a Central Alum.